With this new Budget Milan™ I look at every game as lose-able, there are no guaranteed wins. But I had really hoped that we could pull this one off. Especially at home. With the new pitch, neither Milan nor Inter have won yet at the San Siro. Wouldn’t it have been nice for Milan to break that streak? But Atalanta, true to the goddess they are named after, were not going to fight like typical girls. You can never judge “La Dea” (the Goddess) like an ordinary woman. Because if you do, you might just get beaten by a girl. It didn’t start pretty. In the 5th minute, Boateng, with his hand in some type of cast after his surgery, started his Sky Jousting™ early by taking a perfectly good opportunity and shooting it wide. Antonini was his typical not-so-brilliant self, at least for the first 60 minutes, and so he and Urby missed some great chances to link up simply on account of a lack of abilities. Continuing with Antonini, in the 21st, his error lead to an Atalanta possession that eventually forced Abbiati into his first of many saves on the night. In fact, Abbiati is going to have nightmares of one German Denis coming for him again and again and again. I swear on my life I thought I was watching a youth football match, as everyone seemed nailed to the ground in their positions, no one was running at all. Then in the 27th, Boateng, a player who is typically kinetic, fell and seemed to hurt his hand. Why he was left on the pitch is so beyond me. He was also having a really hard time staying on his feet the entire first half, too. 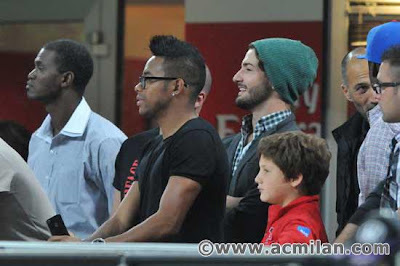 In the 28th, we saw Urby hook up with El Shaarawy, a combination that was successful several times on the night. In the 31st, we saw Ambrosini come forward to take a shot, something we also saw a few times on the night. Why risk him after surgery? In the 42nd, El Shaarawy earned himself a yellow for a clumsy tackle from behind, but to be fair, at least one person on the team was defending. Then Antonini put in a good cross in the 44th (yes, you should have taken a drink for that one,) and El Shaarawy took a nice shot that was saved, too. El Shaarawy was very dangerous in the area, with a little more support, I am sure he would have scored on this night. Ambrosini seemed to be trying to show everyone what they needed to do to win, he started off the second half with a great pass to El Shaarawy, but was subbed off in the 55th for Nocerino, who probably should have started. Abbiati kept saving everything that came his way, which he had to do because Bonera was playing. Acerbi was decent, but certainly can’t play the role of two center backs. I am not sure why Allegri keeps lining up Bonera, in effect having us start with 10 men, but Abbiati was up for the challenge. Speaking of Bonera, he earned himself a caution in the 57th with a yellow card, followed very quickly by a Biondini yellow for a rough foul on Nocerino. More shots by Atalanta, more Sky Jousting™ by Boateng. Then, in the 64th, the impending doom. Our lack of defense could only hold so long, and it was a Cigarini goal that sealed our fate. 1-0 Atalanta. After that, we apparently became incontinent. In the 69th, there was a triple epic fail where Urby tried to cross it in to Boateng, who kind of whiffed it to De Jong, who also whiffed just inches from the goal. This inspired Allegri to take El Shaarawy off for Boy-band in the 70th. Now, I understand like-for-like substitutions. But Pazzini was struggling just to stay alive out there, having just come back from injury and still struggling to become match fit. El Shaarawy was our best player, having created the best scoring opportunities for sure. This would be a time Allegri would need to have some flexibility with his formation, maybe try that 4-3-2-1 that worked before. But instead, he left Pazzini to die and brought on his like sub, just like I’m sure he’s read about in books. Nocerino was playing as beastly as ever, he had some shots and some attempted shots, I have to think he would have found a way to score if he’d played from the start. In the 79th, Allegri subbed Constant on for Urby, another like-for-like that was mindboggling, considering how much hustle Urby gave tonight. Then Cigarini earned himself a yellow for timewasting as he was being subbed off, but somehow with the only goal of the match, I’m guessing he could have cared less. Apparently one's teammate's Sky Jousting™ doth amuse thee? In the 84th, Moralez sent a shot that Abbiati just tipped over, again, Abbiati really carried the defense tonight, the score is so unfair to him. Then Moralez got a yellow for timewasting on the ensuing corner, and Raimondi, not to be outdone, earned a yellow just seconds later for tussling with Abbiati in the box. In the 89th, Bonera also Robinhoed™ a shot straight into the stands. A shame, because had he scored that one, it would have doubled his career goal total. Bojan contributed with a nice shot in the 91st, too bad Consigli saved it. And just shortly thereafter, Manfredini was taken out by his own keeper, that looked like a nasty injury. But at full time, Cigarini’s goal was the only one, victory to the Goddess. Now for the Allegri rant that you knew was coming. Why? Just why? Two DM’s? We did that before, it was a failure. Plus, we need to keep at least one healthy at all times. Boateng may have been too roughed up to be able to play on Tuesday, he shouldn’t have played today. Bonera is an epic fail, he should not start if he is the only fit player. Antonini played better the last 30 minutes, but I still think we can do better with our other options. We need to rotate the squad, we need better substitutions, and we need better lineups in the first place. Will all the king's horses and all the king's men be able to save his job? Watching Allegri’s lineups is like watching the story of Humpty Dumpty – when he fell, all the king’s horses and all the king’s men couldn’t put him back together again. 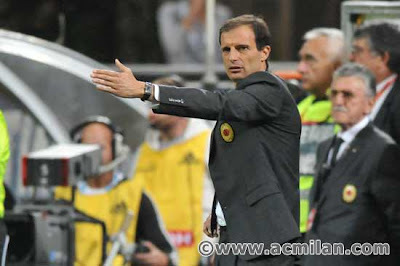 Allegri actually has all of the pieces of the puzzle, he just can’t put the right pieces into the right places. It is so frustrating to watch. I would love to see someone else take the team for a match or two and just see if our theories as fans would hold true. He really is a decent coach, but everything is stacked against him, and his stubbornness will likely prove to be the final straw. With 63% possession and 17 shots, 7 of which were on goal, compared to Atalanta’s 10 shots, 4 of which were on goal, we should have really won this one. So here we sit, 3 games in, 2 losses (both at home) and a win, and we host Anderlecht on Tuesday on the same pitch we lost at twice. Certainly these desperate tactics and foolhardy lineups won’t hold up against them. But then we warned ourselves this was coming. Instead of a team built around Ibra and Thiago Silva, as promised, we have a team being built around Bonera and Antonini instead. That is not a team that is going to win the big games, that’s not even a team that will win against a lower table team like Atalanta. But one reminder – last season, we started off poorly, too. So maybe there’s still hope. It would be one thing to have been beaten by a girl, but at least we were technically beat by a Goddess, so with a little luck and a lot of alcohol, maybe we’ll get through this season after all.